number which are located on the bottom of the unit. Sl::ItCI'. (' .,..1 "thll. ,and Vo.r m.., h~ oU.. • ,'''" "'~,c"
-..---._-- ....---------- ------ . -.- ----_ . Thank you for your purchase of the SHARP scientific calculator model E L.5001. 2. A soft, dry cloth should be used to clean the calCUlator. Do not use solvents or a wet cloth. aboid possible demage ceused by battery leakage. 5. Do not incinerate used batteries when disposing of them. 6. If service of your calculator Is required. use only an authorjzed SHARP service center. BATTERV' REMPLACEMENT . . . . . • . . . .
1. Trigonometric functions . . . . • . .
5. Inverse hyperbolic runction . 6. Exponential runction . . . . .
8. Square and cube root. 9. Power function (yXI . 10. XJY IX th root or YI. 11 . F 8ctoriel. . .
1. Plot calculation . . . . .
4. Integration.... . . . . . . . . . .
5. Complex number calculation and coordinate conversion. 6. Celculation of the vector. When the power switch is turned on, The calculator is ready for operation. All entries or answer will be displayed in either floating decimal or scientifIc notation. ,,! [ rad } J. "2M" Position M, and M, are used as store memories. "( )" POSiTion M, and M, are used as parentheses. Note: This selector is effective when special function mode selector,s set at "N". keys through the symbol display window. Used to perform each of the six 16) special functions. numbers and the instructions IIxcept for the number on the display will be cleared. Used to en ler numbers. • If depressed following the[£]key. a permutation nPr will be calculated. II depressed following theWkey, a combination. nCr will be calculated. the function keys or the special function keys. Ii.e. log, cos' l , 3.jX • etc.!. • If depressed following theWkey, calculates the factorial of the displayed number. Changes the sign of the displayed number from a positive to a negative or from a nega. Positions the decimal point in an entered number. display. To clear the memory depress theWkey follOwed by the B key. with the number in the display. contents 01 the lst memory remain unchanged. Ex. Multiply 5 by 9 end add the IInswer to the contents or the memory. it with the number in the display. .;-l. yX, x.JY, nPr and nCr calculations. key. displays the contents of the 2nd memory. contents of the 2nd memory remain unchanged. • Displays the contents of the independent memory. Used to obtain the sine, cosine or tengent of e displayed number. key. the inverse trigonometric lunctions are calculated. ~. Gives the square of the number displayed. • If depressed following the IT] key, calculates the squre root of the number displayed. Converts degrees/minutes/seconds to their decimal equivalents. selector for selectable special functions. Ex. Converts 12°30'45" to its decimal equivalents. Ex. Converts 12.5125 degrees to degree/minute/second. • If depressed following the IT] key, converts decimal degrees to degree/minute/second. Calculates the antilogarithm base e & base 10 of the number displayed. 2.718281828) & base 10.of the number displayed. • Raises a number to a power. bolic function (sinh", cosh-', tanh") is calculated. key, calculates the Xth root of y.
Ex. • When 213 instead of 231 is entered by mistake. Used to Open parenthesis. This key works up to 2 levels. Used to enter the exponent of a number. When 1he position of the stOre memories/parenthesis selector is in the "2M". When PLOT mode is set. • If depressed following them key, calculates the cube root of the number displayed. IT] key, calculate the recIprocal of the number displayed. Used to clear an incorrectly entered number. number (i.e. : mantissa or exponentl. The following symbols are displayed in the symbol portion. Appears on the mantissa symbol portiDn when an overflDw or errDr is detected. Dimming of the display indicates that the batteries should be replaced or recharged. Two" AA" dry batteries or the Ni·Cd battery pack EA·18B. 3. Replace the banery. Be sure that the "+" and "-" mark on the battery correspond to the "+"
keys Ii.e. x,';', + , - J. these symbols appear. Appears on the mantissa symbol portion when the plot mode is selected. Appears Dn the mantissa symbDI portion when the root is an imaginary number in a quadra. conversion calculatiom are being performed. tor due to the solvent leakage of the battery. So remove the dead battery promptly. • When installing the Ni-ed battery pack EA·18B, refer to Fig. 2. The display may not work when the power is turned on. 11 Turn the EL·5001 power switch to OFF. insert the power plug intO AC outlet. with the power switch being set at OFF. 5) A fully charged battery provides approximately 7 hours of the continuous operation. recharge the battery by setting the power switch 8t OFF. turned OFF before plugging it in. 1) Turn the EL-50Ol power switch to OFF. and then insert the power plug inlo AC outlet. 3) Turn the EL·5001 power switch to ON. Use of other than AC adaptor/charger EA·17 & the Ni·Cd battary pack EA.18B may apply im. proper voltage to your SHARP calculator & will causa damaga. There are several situations which will cause an overflow or en error condition. When this occurs. EO. will be displayed. The(];Jkey must be used to reset the error condition. The following will cause an overflow and errors. 1. The absolute value of a calculation result is greater than 9.999999999 x 10"
3. The absolute value of a result of memory calcuilltion is greater than 9.999999999 x 10"
smaller than 1 x 10 •••. 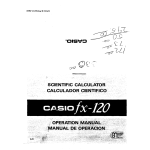 is out of the calculation range on page 91 are performed. other keys are electronically locked to avoid mis-ealculations. system. Additional digits entered will be ignored. The exponent portion of the entry may contain 2 digits. If more than 2 digits ara entered. only the last 2 digits entered will be accepted. "N" and non-plot mode unless otherwisa specified. decimals (Ex. 0.1234567891) will automatically be converted into scientific notation. symbol portion) will be IiI. • To obtain an accurate result. be sure to perform the following operation before starting calculations. The table for the relations between the effective keys and the mode. sin", cos-', tan-', aX, lOX, In. log. I. n. m. N : Special function keys. (54 X 10' + 6.76 x 10').,. (1.25 x 10- 12 I'"
The eccuracy of functions are described in "SPECIFICATIONS". x'. l/x.lI' nl. ( • l .
be entered as integer end decimal respectively. • The 5th through end decimal digits are decimal degrees. Convert decimal degrees to degree/minute/second. Convert degree/minute/second to its decimal equivalent. .p. . . . . This calculation is to plot a function by entering the initial value and the pitch value. , The special function mode selector must be set at "N". Note; As for the functions available in plot calculation, refer to the teble on page 30. 11 The functions essigned to the special function keys. Used to set the plot mode. instruction in the calculation except for the independent memory will be cleared. Used to enter the initiel value into the calculator in plot calCUlation. Used to enter the pitch value (.u:1 intO the calculetor in plot calculetion. Set the plot mode by depressing the M key. Depress the key of the desired function consecutively. then the answers at the poi"
x. + 114X will be displayed. f nput the in itial value x.
iii) Entar the constant A followed by the~orm~keys. iI Set the plot mode. planing from x lI +1 on the new scientific function with the same .:u:. Displays the number of samples entered. Used to obtein the sum of the data (Ex). Used to obtain the mean value of the data (x). Used to obtain the. standard deviation of the ,amples (sl. standard deviatioh of samples and populations can be obteined. To perform statistical calculations set the special function mode selector at the "STAT"
Used to obtain the standard deviation of the population (01. Used to enter the data (numbers). 1) The functions assigned to the special function keys. deviation of samples (s) and the other is thllt of the population (01. 'v before and after a st8tistical calculation. To enter the above data. depress the8 orITJ8 keys following the data. • Set the special function mode selector 8t the "EO" mode. 1,) The functions assigned to the special function keys. the entry of the value a, band c.
Note: In case of imaginary root, onlv imaginary number portion is displaved. Enter the value of a, band c in this order. Note: In case of imaginary root, on IV reat number portion is displaved. When you want to correct any number entered, just enter the right numbers. Note: The number of a, band c must be entered in this orders. c in the quedratic equation. :r in the "/ " mode. has been completed by the l;nul key. If you want change any values of a, b & k, simply reenter the desired numbers. Used to enter the coefficient lkl. Used to enter n. and parform the definite integration. numbers in the "a + hi" mode. Set the special function mode selector at the "a + bi" mode. 1 J The functions assigned to the special function keys. number portion or the calculated result. And also used to display the value of x or r of the calculated result. imaginary number portion of the calculated result. And also used to display the value of y or 9 of the calculated result. Used to convert rectangular coordinates into polar coordinates. Used to convert polar coordinates into rectangular coordinates. (4) arithmetic calculations will become impossible. To correct 8 mis-ilntry of a or b, simply re-ilnter the right numbar. 2 I. the absolute value and the amplitude. Calculates the values of x and y.
vectors, and coordinate conversion similar to the "a + bi" mode. calculated result in addition and subtraction. the calculated result in addition and subtraction. And also used to display the value of y or 8 of the calculated reSUlt. As to the calculation method for the coordinate conversions, see page 81. Ex. 1 Calculates the component x and y of the vector c.
IS: b I .. a, b, + ii, b.
x = 0 , IXIoF-!! 1st and 2nd operand. calculated result: t 1 x 10'" - t9.999999999 x 10"
The accuracy will become low around singular points and inflection points. _227.9559243 < x ~ -1 x 10-"
-227.9559243 <x - loy~ -1 x 10-"
1 x 10-" ~ .!. A" fb kxfldx '" ..!.. [x"+1) b .
sub. of the complex numbers. exponential display system and vice versa. Minus symbol appears both in mantissll and exponents portion. Four arithmetic calculetions, multiplication and dil/ision by constant. Display 55555. at the ambient temperature: 20 C (68 Fl. or the way of use. AUI1,aJII, Hang Kong, ltan, JIPIn.l(uwIIl. Lf'banon. Mlr'VlI"
Pan.-nl. Philipp",,,, SlnQlIPOfi. Soulh A'"I:", Thal,.nd.